Dry to wet. Meadows, fields, prairies, roadsides. Full to partial sun. This is an erect perennial forb. 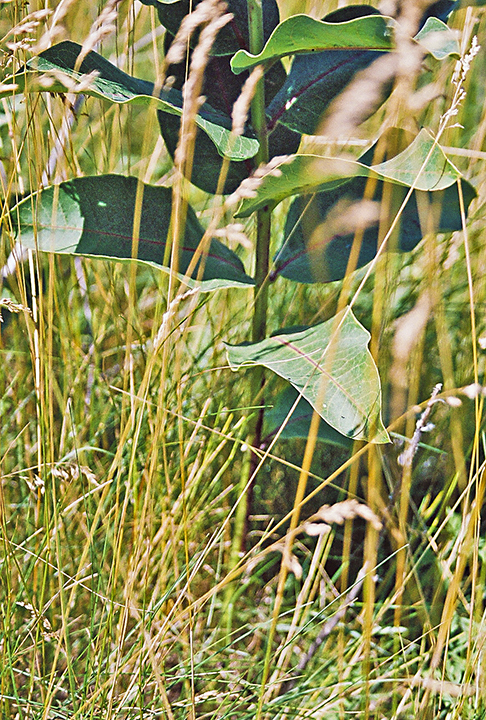 A single stem rises from a long, creeping rhizome. It often forms colonies. The leaves and stems contain a milky juice. The stems are erect and unbranched. They are covered with short, matted or tangled, soft, woolly hairs. The leaves are opposite, thick, untoothed, 2½″ to 8″ long, 2¼″ to 4″ wide, and egg-shaped to elliptic or oblong. They are rounded at the base and taper to a point at the tip. They are attached to the stem on leaf stalks that are from less than ¼″ to over ½″ long. The upper surface is softly hairy, the lower surface finely woolly. 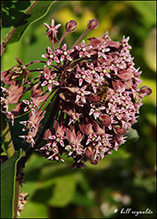 The inflorescence is usually several dense, drooping, umbrella-shaped clusters (umbels) rising from the upper leaf axils. 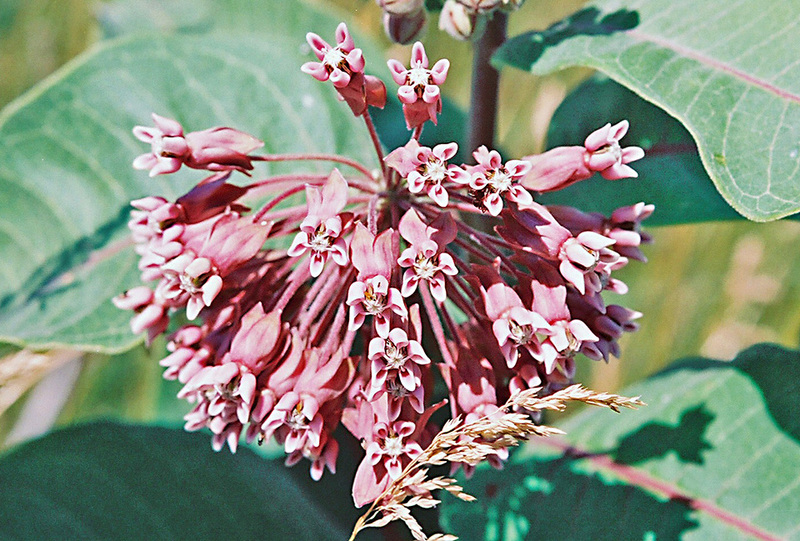 The clusters are 3″ to 4″ in diameter and erect on a hairy, 2″ long stalk. They typically have 20 to 130 flowers. 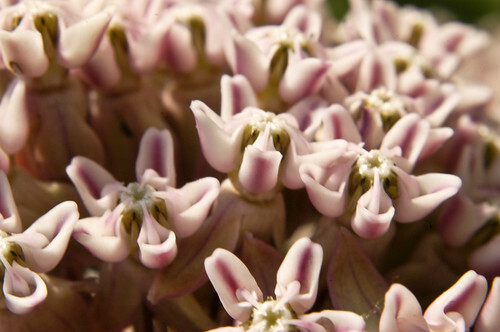 The flowers of this plant are shaped like the typical milkweed flower. They are ⅜″ to ⅝″ tall and ¼″ wide. The petals are pink to reddish-purple. They bend backward at the base, hang downward, then curl upward near the tip. They are separated from the hoods by a short but distinct column. The horns are shorter than the hoods. They project from the hoods and are curved inwards. The flowers are highly fragrant, the scent noticeable from yards distant. The fruit is a fat, spindle-shaped pod. It is 3″ to 4½″ long and ¾″ to 1½″ thick. It is densely warty. It is held erect on a downward-pointing stalk. It opens on one side exposing the seeds to spreading by the wind. 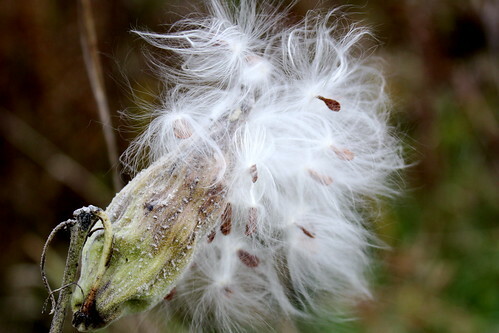 The seeds have a tuft of white, silky hairs at the tip. 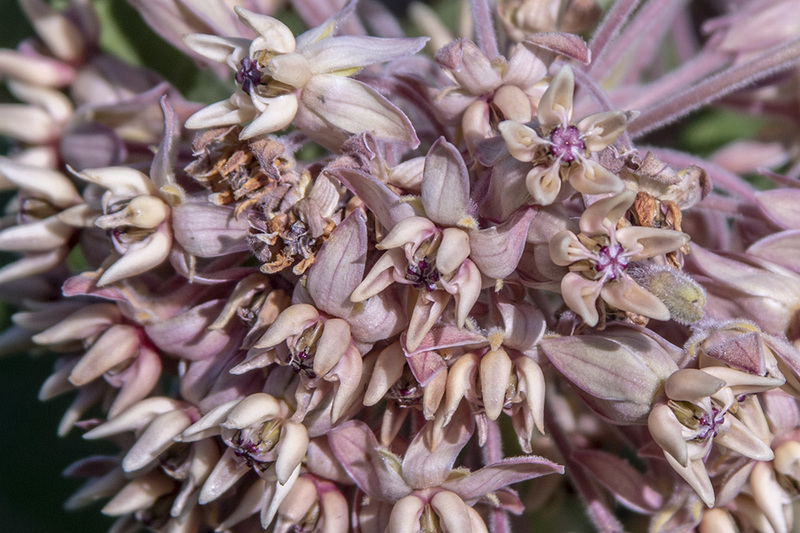 Clasping milkweed (Asclepias amplexicaulis) stems are hairless and glaucous. The leaves are rounded, not pointed, at the tip. They clasp the stem at the base, They are hairless and glossy on the upper surface, and are glaucous on the under surface. The leaf margins are strongly wavy. There is a single umbel appearing on a long stalk at the top of the stem. The umbel is erect and has 18 to 60 flowers. The petals are green tinged with red or purple. The horns are much longer than the hoods. 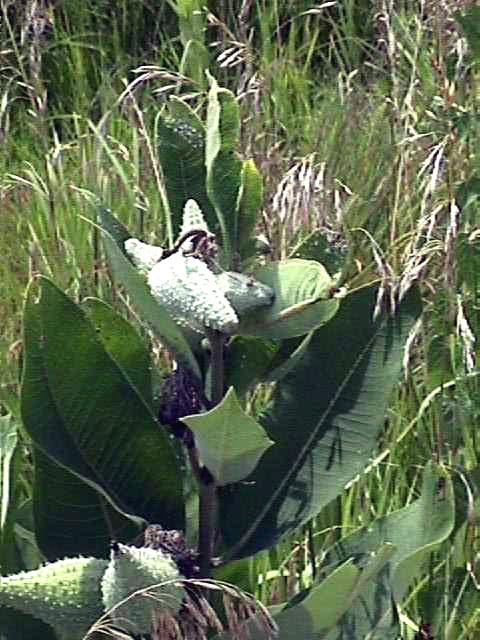 The fruits are long, thin, and pointed and are not covered with warts. 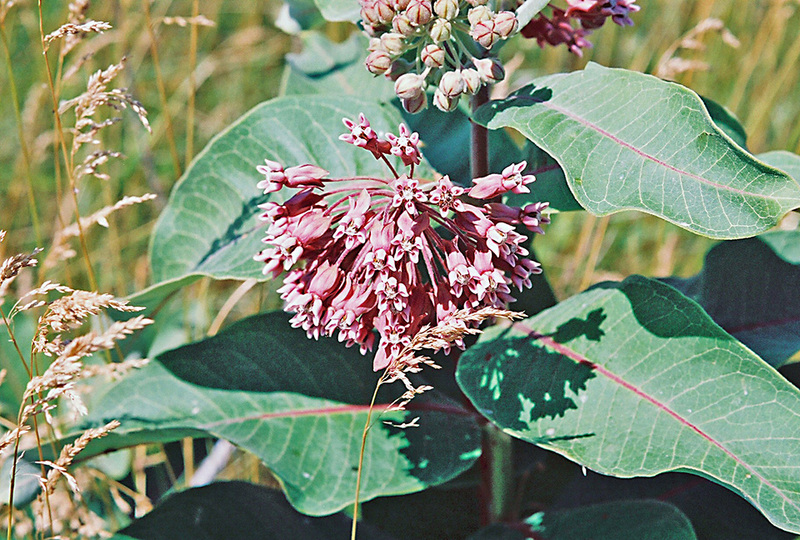 Purple milkweed (Asclepias purpurascens) stems are unbranched and are covered with short, fine, soft hairs. The umbels are erect, appear near the top of the stem, and have up to 50 flowers. 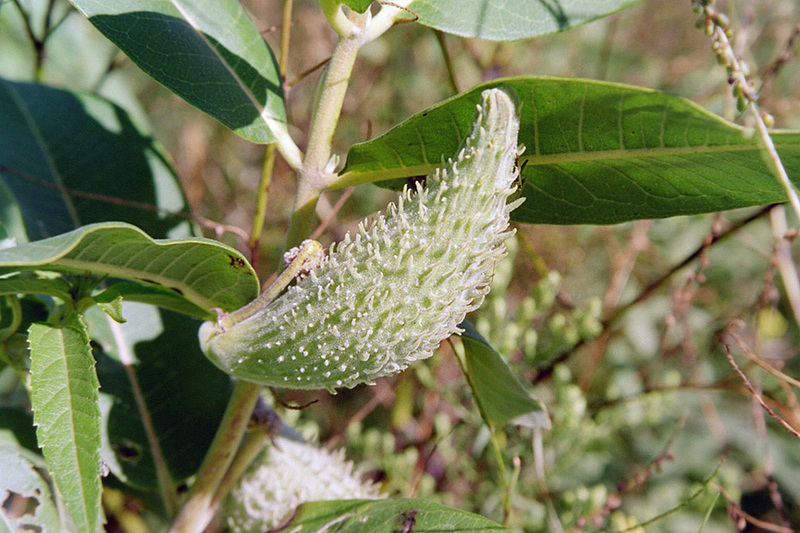 Sullivant’s milkweed (Asclepias sullivantii) is a much shorter plant, 1′ to 3′ tall at maturity. The leaves and stems are hairless. The leaves are acute-tipped, ascending, with a reddish central vein. The umbels are looser, on a hairless stalk, and have 15 to 40 flowers. The flowers are larger. The fruit is narrower and smooth or slightly warty. 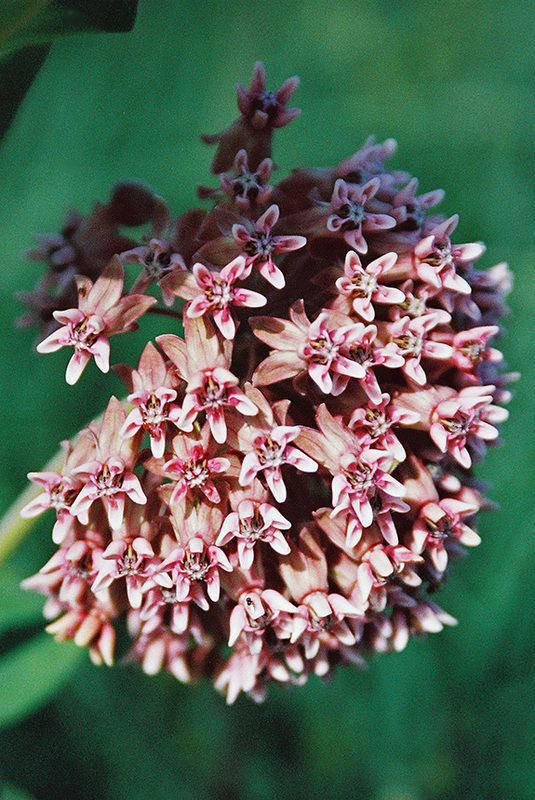 Swamp milkweed (Asclepias incarnata var. incarnata) stems are usually branched above the middle, and are hairless except for a vertical line of hairs on each side between the leaf nodes on the upper half. The umbels have 20 to 30 flowers. The horns are much taller than the hoods. The fruits are narrow, not fat, and are smooth, not covered with warts. It is usually found in wet areas. 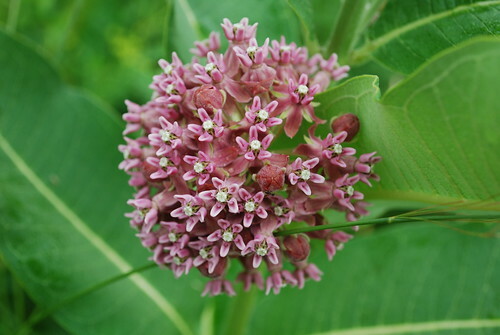 The native plant today is the Common Milkweed (Asclepias Syriaca). 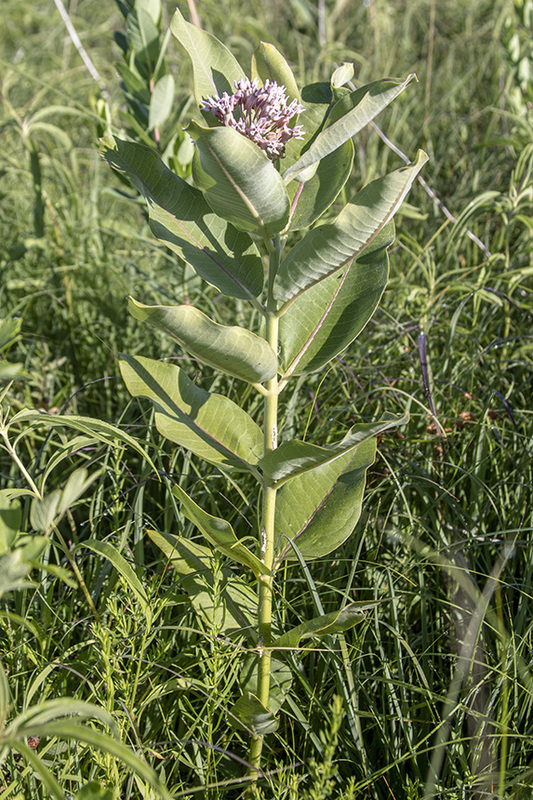 Common throughout all of Minnesota and the host plant for the Monarch butterfly. 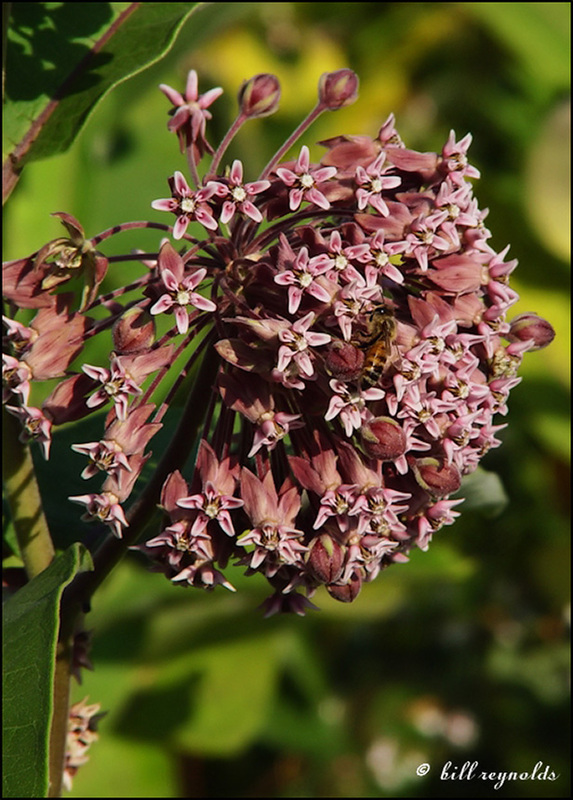 This milkweed patch has hundreds of butterflies nectaring on the Common Milkweed (Asclepias syriaca) blooms. Taken just south of Raleigh, North Carolina, on September 5, 2013. 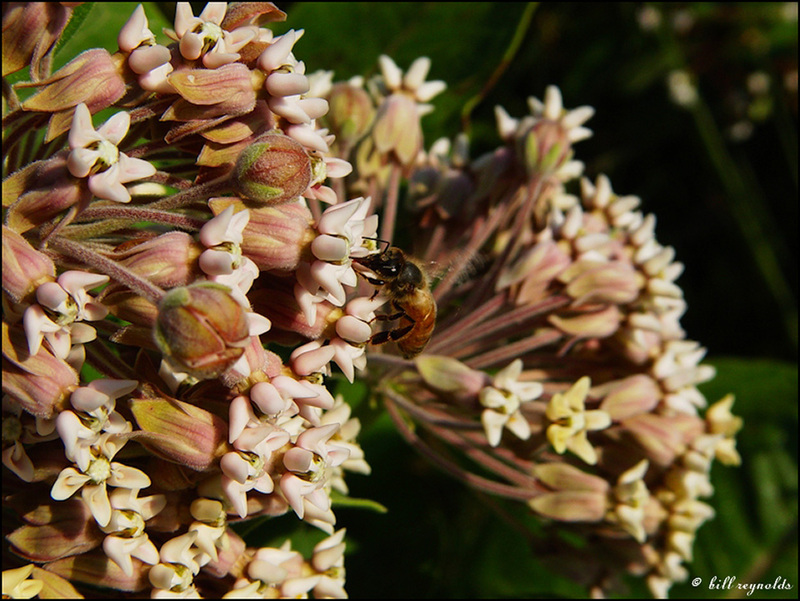 Honeybees forage in common milkweed (Asclepias syriaca) as Killdeer Plains Wildlife Area in Wyandot County, Ohio, USA. A bobolink sings in the background. Photographed at the Turtle River State Park, North Dakota (29 September 2012). 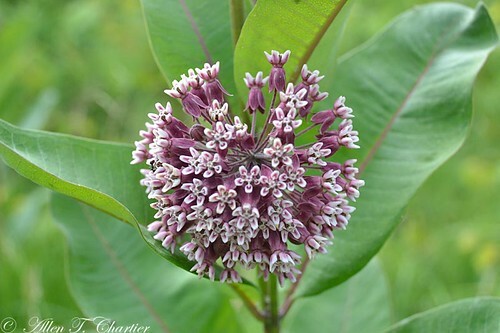 I have hundreds on my milkweed in South St. Paul. Should I kill them?